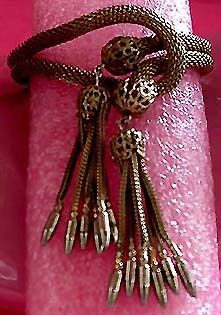 VINTAGE COSTUME ANTIQUE ESTATE JEWELRY BRACELETS! 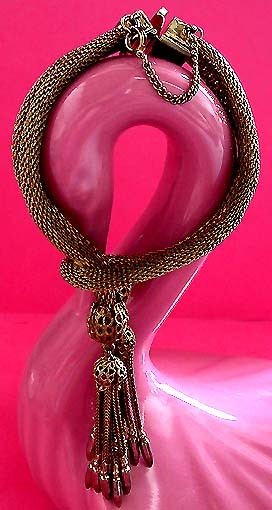 Hobe Mesh Antique Goldtone Vintage Antique Estate Bracelet with Two Tassels For Weddings, Proms, Pageants And Parties! Item #BR16837 - Hobe Mesh Antique Goldtone Vintage Antique Estate Bracelet with Two Tassels. Size: Length: 8". Width: almost 1/2"; the loop is 1 1/4" wide. Designer: Signed Hobe with a long 'H' and 'b'. Hobe has been in business since the late 1800s, rich in jewelry history and it seems to be a family tradition. The jewelry items they created in the early years were of museum quality even though they were Costume jewelry. They were considered good enough for queens. Hobe quit manufacturing jewelry sometime in 1992. Unique Hobe antique mesh bracelet! What a rare find! What a treasure! 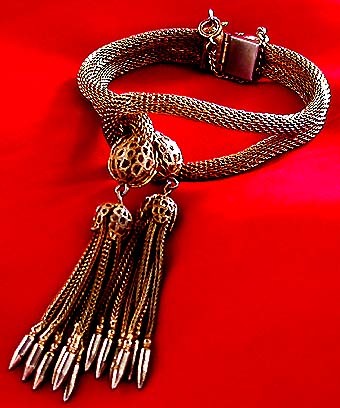 Two thick round shimmering mesh antique goldtone ropes joined together to be worn around the wrist with two alluring tassels dangling invitingly through the large loop. 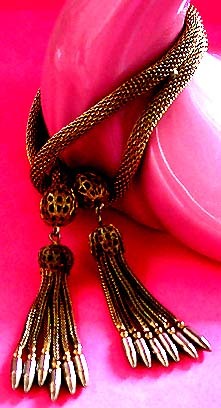 The fantastic tassels are almost 3" in length and have four beautiful tooled out filigree balls! More, the box style insert clasp is engraved with antique floral motiff and has a safety chain to ensure you don't lose this Hobe treasure. The clasp snaps shut securely. Worthy of a musuem piece. Excellent condition. A fabulous bracelet to wear at weddings, prom nights, pageants, parties, cruises and special functions! Excellent condition. US$248.00. SOLD.